According to the Centers for Disease Control and Prevention (CDC), more than 600 people are killed in the United States every year by extreme heat. Heat-related deaths and illnesses are preventable and something to monitor with summer’s high temperatures. Heat exhaustion or heat stroke happen when the body is not able to properly cool itself. While the body normally cools itself by sweating, during extreme heat, this might not be enough. In these cases, a person’s body temperature rises faster than it can cool itself down. This can cause damage to the brain and other vital organs. Summertime activity, whether on the playing field or the construction site, must be balanced with actions that help the body cool itself to prevent heat-related illness. The three basics to avoiding a heat-related illness are to stay cool, stay hydrated and stay informed. * Stay cool indoors – Stay in an air-conditioned place as much as possible. If your home does not have air conditioning, go to the shopping mall or public library—even a few hours spent in air conditioning can help your body stay cooler when you go back out in the heat. * Limit outdoor activity to when it’s cooler outside. Early mornings and late evenings are best. * Drink Plenty of Fluids: Drink more fluids, regardless of how active you are, and don’t wait until you’re thirsty to drink. If your doctor limits the amount you drink or has you on water pills, ask how much you should drink while the weather is hot. * Stay away from very sugary or alcoholic drinks—these actually cause you to lose more body fluid. Also avoid very cold drinks, they can cause stomach cramps. * Replace Salt and Minerals: Heavy sweating removes salt and minerals from the body. A sports drink can replace the salt and minerals you lose in sweat. * If you are on a low-salt diet, have diabetes, high blood pressure, or other chronic conditions, talk with your doctor before drinking a sports beverage or taking salt tablets. * Check local news for extreme heat alerts and to learn about any cooling shelters in your area. 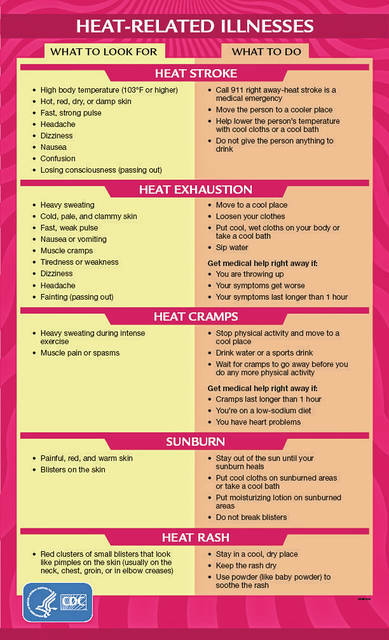 * Know the signs and symptoms of heat-related illnesses and how to treat them. * Use a Buddy System: monitor the condition of your co-workers and have someone do the same for you. Heat-induced illness can cause a person to become confused or lose consciousness. Keep your provider informed if you have experienced any symptoms of a heat-related illness. If you do not currently have a family provider, Fayette County Memorial Hospital Medical Surgical Associates is accepting new patients. Dr. Emily Johnson and Dr. Marta Gryniuk and their staff of certified nurse practitioners are ready to assist you. To schedule an appointment, contact 740-333-3333. If you experience nausea, dizziness and a temperature of 103 degrees or more, please call 911.